Question: I want to know if it is okay to read the higher books by the Goswamis, describing the intimate pastimes of Radha and Krishna? Srila Govinda Maharaja: We are not doing that. In my forty two years with Srila Guru Maharaja (Srila Sridhar Maharaja) I never once heard him give permission for that to us. I know many of the books you are speaking of, very well; that is my position was somewhat different. 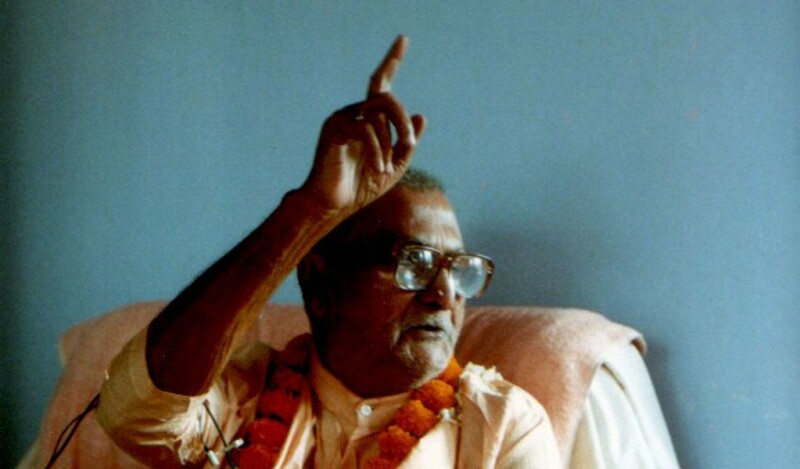 Srila Guru Maharaja is a Paramahamsa Vaishnava and I was his personal servant up until about 1983, when I engaged some others for his personal service. At that time my seva responsibility increased in such a big way that I was unable to always serve Guru Maharaja in person, still I was always looking after his health. From 1973 I was treating Srila Guru Maharaja as his doctor. Guru Maharaja was so ill that all the doctors had said that no medicine could work in his body, and they were sure that within a few days or a week at most he would leave his body. Of course Guru Maharaja’s body is siddha body, but still all the most qualified doctors said that it was beyond their capacity to treat him. All the Homeopathic doctors who had treated Guru Maharaja had prescribed Nux-Vomica and administered it from 30 to MM potency, but none had had the desired effect. As they had all prescribed this same medicine, I concluded that Nux-Vomica must be Guru Maharaja’s constitutional medicine. I then went to an Allopathic doctor and asked him what is the dosage of Nux-Vomica mother tincture in Allopathy. It was eight drops maximum, so I decided to give Guru Maharaja five drops. When the first signs of the headache came I administered the five drops of the mother tincture and the headache was reduced to a standby position. I was confident that now this headache will go because previously no medicine could check it. The only other medicine that could give Guru Maharaja relief from his condition was Cafergot, a type of Ergotamine. Ergotamine is a very serious drug, and through taking this, all of Guru Maharaja’s health problems came, but it was the only relief possible before now. After about two or three hours again the headache came and so I gave Guru Maharaja 1/4th dose of the Ergotamine, and again after about another six hours the headache returned and I gave the Nux-Vomica. In this way alternating between the two, and then after twenty four hours I stopped the Ergotamine and continued with the Nux-Vomica along with Lord Siva’s medicine and two other homeopathic medicines I had selected. That headache was then completely gone forever and so in this way I was the doctor of Srila Guru Maharaja. Still if I was not at the Math I left instruction that if the need arose then the Allopathic doctor should be called. Once Guru Maharaja was suffering from bronchitis and so Hari Charan prabhu called the top doctor of Nabadwip, the president of the district medical board. He came and after seeing Guru Maharaja prescribed some medicine. Guru Maharaja flatly told him, “No, I will not take your medicine. Govinda Maharaja is my doctor and only after he comes and says, will I take your medicine.” Then the doctor was very angry and said, “Then why did you call me?” Guru Maharaja said, “I did not call you. Hari Charan called you.” So the doctor replied. “Do not call me again if Guru Maharaja will not take my medicine then why should I come?” And angrily the doctor left. When I arrived, I asked Guru Maharaja what had happened and he told me the events, so I went to see the doctor. When I reached there the doctor was still angry and he said, “Oh, Govinda Maharaja you have come. It is not necessary to come. I shall not go with you. I shall not see Guru Maharaja as my patient.” I told him, “You must continue to see Guru Maharaja.” “Why should I come, he will not take my medicine, No!” I said, “He will not take your medicine that is the truth. That is because you yourself have said that your medicine will not work on him. I am calling you because I am not a very good doctor and you are the best doctor in all of Nabadwip, and if you will examine Guru Maharaja and give your diagnosis and prescription, then immediately I can understand from your medicine what homeopathic medicine I should give instead of that. This is why I call you, and you have love for Guru Maharaja, so you must come.” Then the doctor was quiet and said, “Yes, if that is the cause, then I shall come.” Anyhow this was the history. I could not always stay with Guru Maharaja and so I engaged some others for that. But before that, Guru Maharaja had no other servant, and so we heard many things during our association. And not only that, it was the desire of Guru Maharaja to tell something about the pastimes of Krishna, of Radharani, and others, so we heard from him, but always he told us in a very cautious way. Never did he tell us to read Ujjvala-nilamani or similar books, but some things he told us, and I know many slokas from Ujjvala-nilaman, Vidagdha-madhava, Lalita-madhava and others. That is, Guru Maharaja had me study kavya (sanskrit composition), and it is necessary to read these verses to understand the many varieties of sanskrit metre, language, beauty, alankara, etc. But I can say it is a special case, it is not for all. These books are no doubt the supreme books of our Sampradaya, but they are not for all and everyone’s reading. If anyone will read these books then they will become prakrta-sahajiya, and what will be for them? We do not want that our brother and sister will become that, so we must be very serious about our practicing life. You have left everything; your culture, your allegiance to country, community, your habits, everything you have left to try and practice Krishna Consciousness, so you will have to be serious. And you also need the result. To only practice, that is not your lfe’s goal you need the end result — Krishna Consciousness — and how will you get that result? It is necessary to first understand this. We are chanting Hare Krishna but we have not become perfect. Why? We must research this. Why is it not happening, why is the feeling not coming inside? If it were merely a cheating matter then it would be no problem. But it is not a cheating matter, it is proven in the scriptures of India; the Veda, Vedanta, Upanisad, Purana, there is five thousand years of culture, there are munis and rsis who have all got the result. If you study the scriptures like Mahabharata you will say that all the advices are very good and you will see that so many have gotten the result. Then why are we not getting the result? The time has come for us to know why. Srila A. C. Bhaktivedanta Swami Maharaja Prabhupada has come to this world, Srila Guru Maharaja has come, Srila Prabhupada Saraswati Thakura has come, Srila Bhaktivinoda Thakura — their books and everything are with us, all the property of Sri Chaitanyadev’s Sampradaya is with us, but it is not fruitful to us. Why is this? It is necessary to know. We do not want to cheat anybody, we want to do something good for others, and if we cannot do anything good then at least we will not do anything bad to others. So we must be serious about our practicing life, and that means we must follow the directives given by Srila Guru Maharaja. Before approaching the rasa-tattva, the serious high pastimes of Sri Sri Radha-Krishna, we must prepare ourselves for that, otherwise that will not give us the perfect sentiment. So why is it that when we contemplate that Lila we are getting difficulty and we are going to a hellish position? This we must research carefully, and that knowledge has been given by Bhaktivinoda Thakura and especially by Srila Saraswati Thakura. Srimad Bhagavatam has declared that the lust will be driven out of the heart, and one’s consciousness will come to the level of Krsna-Prema — bodily consciousness will be forgotten and that will be overtaken by Prema consciousness. One must get that position. So why are we not getting it? Harinama is transcendental vibration non-different from Krishna. We are changing the Hare Krishna Mahamantra, but in which way shall we chant? The Mahamantra manifests Himself by appearing in you heart and dancing on your tongue, but if Harinama is transcendental, then I cannot chant with my mundane tongue. This is the truth, the mundane cannot play with the transcendental. Only when the mundane becomes itself transcendental can it come in touch with the transcendental Name. It is very clear, so somehow or another we must make ourselves transcendental. There is a very nice analogy of the moon. The moon is always in the sky but sometimes it is obscured by the clouds. Sometimes we can see it and sometimes we cannot. So the position of Harinama is like that. Like the cloud we are always coming and going, and according to our standard of chanting sometimes Harinama may reveal a glimpse and sometimes He will remain covered, then finally He will reveal himself in our Hearts. We are getting some result, and then we can say yes, it is the truth. But if we get nothing then we will become hopeless and think, why should I spend my time for that? But behind that we will have to see that the reason is because I cannot chant properly. We can see that in every religion there is the chanting of the Lord’s Name in one form or another, so they cannot all be wrong. 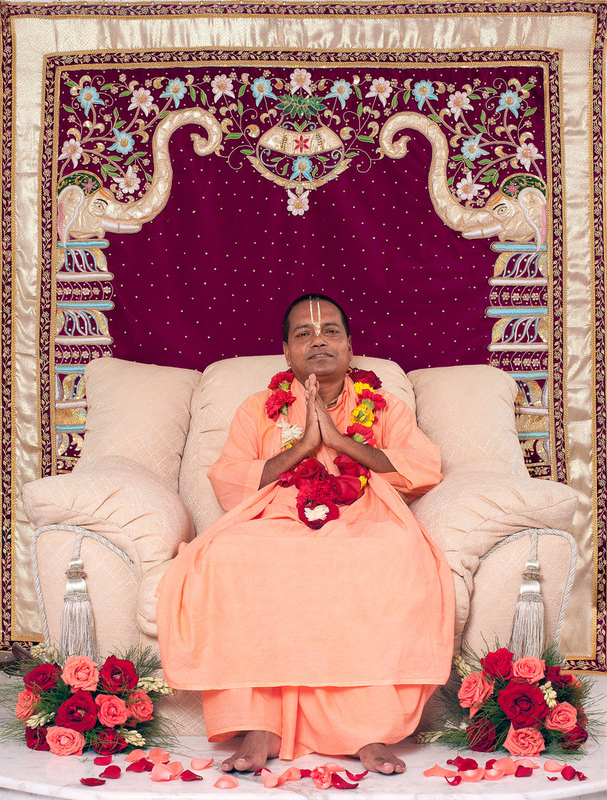 So we can understand that there is great benefit in chanting the Lord’s Name, there is no doubt. And further, in the scriptures of India it is recorded that if you chant this particular mantra then you will get this particular result, another mantra, another particular result. The ancient rsis and munis have discovered and proven this. A rsi is he who can discover something in the field of Vedic religion, a ‘Ph.D.’ of religion and a muni is he who is successfully practicing the Vedic religion. The rsis and munis are all chanting the Lord’s Name. Lord Siva, Lord Brahma, the demi-gods and gods, all are chanting the Lord’s Name. Then inside of the chanting, like the Nux-Vomica, there is the medicine for us. This Krishna-nam is a Form of Krishna, and if you chant the Holy Name of your Lord, then you must get the result. So what is the process to chant properly? Sriman Mahaprabhu has given the three-fold process: Humility, Tolerance, and Honouring others. If we cannot chant properly then in some way we are not following that process. It is our ego. We are getting some result, no doubt, otherwise we would give up chanting Harinama. 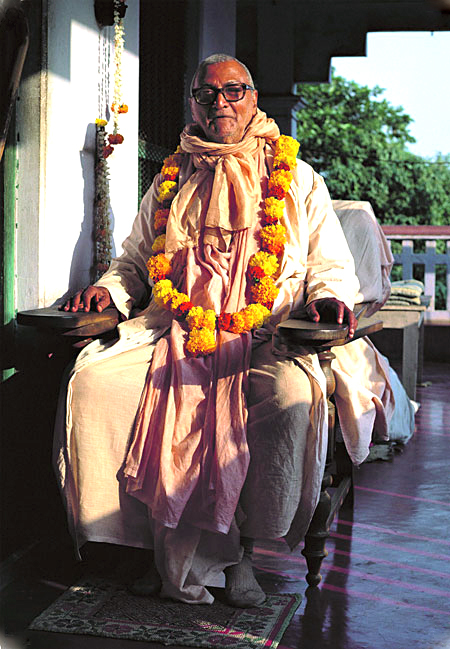 Also, Bhaktivinoda Thakur has said that if we cannot avoid the Namaparadha, offence to the Name, and in all probability we will not be able to avoid, but if our intention is to try to avoid that, then we should pray to Harinama, “Oh Harinama, I cannot properly chant Your Holy Form, so please reveal Yourself within my heart and purify me.” And Bhaktivinoda Thakur has said, “Chanting, chanting, chanting, chanting — somehow, in any way, we need to get the attention of that Holy Name.” In this way we must get the desired result. I can say it is so. Otherwise if it were only cheating then I would have left it long ago. Then everywhere there is harmony, some adjustment, and with full consciousness we shall try to chant the Hare Krsna Mahamantra. Under proper guidance we can read everything. We have a right to read, but that must be under the guidance of a perfect person who knows fully that plane, then no offence will come to us in any way, and we shall not become prakrta-sahajiyas. We must be very serious in our practicing life, then I can give you a guarantee that you must get your goal. You are in the line of Srila Guru Maharaja, you have the mercy of Srila Swami Maharaja and Srila Prabhupada Saraswati Thakur, then you must get it, but you must be very conscious about your practicing life. I have seen many in our line who think they are proceeding very happily and practicing very happily, but they are not seeing themselves through my eyes. Once, I said, “What is devotion and what is emotion?” Are you under emotion or are you under devotion? You cannot see.” Hearing this Sripad Janardana Maharaja said, “Oh Maharaja, you are chastising me.” Actually it is not to chastise anyone, I want to be serious for everyone and for myself also. Already sixty four years of my life have passed and how much longer I shall live I do not know. If we are under emotion, then we must leave that and try to go to devotion. Heart and soul I am trying. Guru Maharaja gave me some service. Previously in the time of Guru Maharaja whatever service I did he would digest. If I did right or if I did wrong, he is digesting that and my service is getting some position, but now all my good and bad is coming to me, and so I must be even more serious. And all the devotees are really very good, otherwise why are they coming in the line of Krishna Consciousness? Then I must be serious for them also. 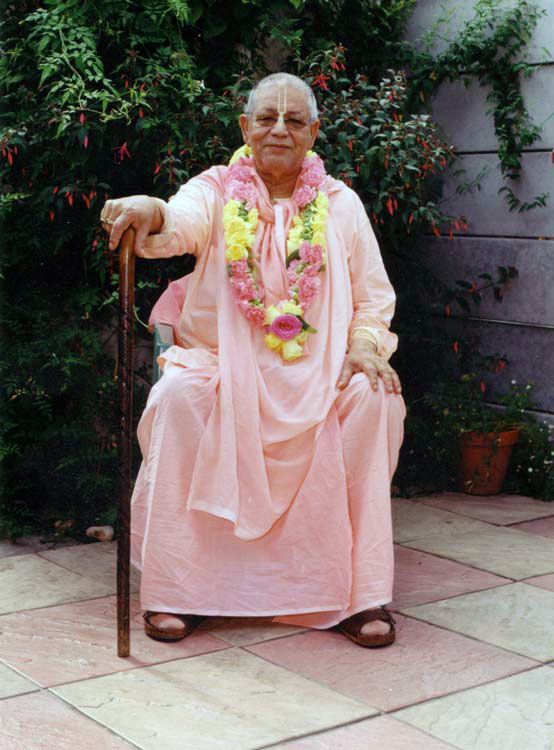 I must teach them, “Please come this way, don’t go that way.” That is my duty given by Srila Guru Maharaja, and if I can do that seriously and with all sincerity, then they will get the result, I will get the result and visvam purnam sukhayate — the whole world will be benefited.